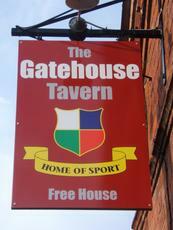 The Gatehouse was much quieter than the other city centre pubs. But this was much appreciated. It's a pub where the clientele are clearly heavily into rugby. It's a bit dark inside and there were a few characters in. But the ale range was fairly decent. Bass is the regular ale. Guests were Church End Stocking Filler, Slater's 1 Hop, Nobby's Holdings, Wadsworth 6X & Hook Norton Old Hooky. The real cider was Saxby's Traditional. Recommended. Large ceiling sports bar - with the volume on a touch too loud. For darts, at least. All the furniture is around the outside, leaving a barren space in the middle. Tv mounted above the door, so on entrance and if you sit under it, you feel that everyone is staring at you. The bass was in perfect condition, alongside several other hand pulls. Looked like it was staffed by enthusiasts who love their job. Always a good sign. Disappointed. Beer range OK. Big focus on the outside garden when I visited Saturday, with a BBQ, probably why. 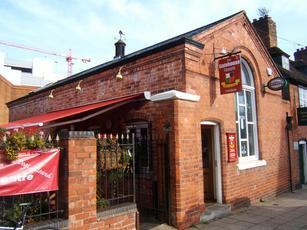 Visited on Saturday evening - pretty quite - six ales on as stated in previous post. The most local brew was from Church End which I think is Shropshire had two pints of this - it was decent enough and well kept. Well worth a visit , had 6 ales on when I called in . The three I had were all of good quality and not over priced , they even run a loyalty card to save even more . This is a free house so the beers are regularly changing . Nice in the summer to sit outside in the biggest pub garden in town .